At Escondido Federal Credit Union, you have several options to save for retirement, all of which are separately insured up to $250,000 by the NCUA. Many of these plans allow you to contribute pre-tax dollars, maximizing your retirement savings. In addition, EFCU offers the Coverdell Education Savings Account (ESA), an IRA-like account that lets you grow funds potentially tax free. You can save up to $2,000 annually for a child's elementary and secondary education with this account. One of the smartest ways to grow additional savings for your retirement, the IRA earns dividends just like a savings account, but with a twist. Dividends that are paid are not taxed as long as they stay in the IRA. 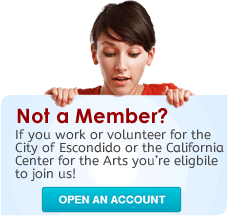 Escondido Federal Credit Union pays dividends each month, so your earnings add up faster! Earnings continue to be tax deferred until you start to withdraw from the IRA. A significant benefit: if you meet certain qualifications, your contributions may be tax deductible,* letting you save even more! Eligibility—member of EFCU, under age 70½, earning income. No monthly fee when a low minimum balance requirement is met ($100). No set up fee, no administrative fee. Dividends—calculated daily and paid monthly on balances of $100 or more. Safety—each IRA is separately insured up to $250,000 by the NCUA. Convenience—access your account via ARTS (bank by phone) and online banking. Who may contribute, and how much? Has earned income equal to or greater than the Traditional IRA contribution. No contributions may be made past age 70½. Withdrawals—may be made without penalty starting at age 59½. You must start making withdrawals at age 70½. What is a spousal contribution? The couple must be married and must file a joint federal tax return. An IRA must be established for the non-compensated spouse. The spouse receiving the contribution must be under age 70½. To get more information, give us a call or visit one of our branches during business hours. *One of the potential benefits of contributing to a Traditional IRA is that a tax deduction may be available. Whether a contribution or a portion of a contribution is deductible depends on active participation (participating in or receiving contributions) in an employer-sponsored retirement plan, marital status, and modified adjusted gross income (MAGI). Consult a qualified tax professional to determine what portion, if any, of your contributions may be tax deductible. **Ask your qualified tax professional for requirements. Another option for tax deferral, the Roth IRA lets you make withdrawals without having to pay taxes on the amount withdrawn or on earnings as long as you follow IRS rules. Contributions you make to a Roth IRA are not tax deductible. Ask your qualified tax professional whether a traditional or Roth IRA is best for you. Eligibility—member of EFCU, earning income. You have reached age 59½. You are using the funds (up to $10,000), for the purchase of your first home. Distributions are made to your beneficiaries in the event of your death. Eligibility— member of EFCU, earning income. The maximum SEP contribution is the lesser of 25% of compensation or $49,000 (2009 and 2010). Eligible participants who are age 70½ or older may receive SEP plan contributions. Employer SEP contributions are always 100 percent vested. *Ask you qualified tax professional for complete information. Saving for your child's education? One way to accelerate the growth of the money you're saving is the Coverdell ESA. What is a Coverdell Education Savings Account (ESA)? Who can contribute to a Coverdell Education Savings Account? The answer to that question is almost everyone. Individuals with modified adjusted gross income (MAGI) within the applicable limits for their filing status. Any corporation or other entity (including tax-exempt organizations) irrespective of income limits. Each child can receive a total of the maximum allowed per year in contributions from all sources. It does not make a difference if this is done in a single account or multiple accounts designed to benefit the same child. In 2010, individuals may be limited in the amount of their contributions if their modified adjusted gross income (MAGI) exceeds $95,000 for single filers or $190,000 for married tax filers. Above these income levels, the ability to contribute is phased out. If income exceeds $110,000 for single tax filers, or $220,000 for married tax filers, no contribution is allowed. Eligible taxpayers may deposit up to $2,000 per year into a Coverdell ESA for a child under the age of 18. Parents, grandparents, other family members, friends, and even the designated beneficiary of the ESA (child) may contribute to an ESA for the same child, but the total contributions for a child for a taxable year cannot exceed $2,000. Eligible taxpayers may contribute up to $2,000 for multiple children in a year, however. Who is a designated beneficiary? A designated beneficiary of an ESA is the person on whose behalf the ESA has been established. *As your qualified tax professional for complete information.